This example will be used to demonstrate the application of damage tolerance requirements at the early design stages of fail safe structure. This example will demonstrate the steps necessary to establish the crack arrest capability of the structure and present the trade-offs necessary to establish stringer spacing and sizing in built-up structure. A transport wing is being designed to satisfy the requirements of JSSG-2006. Three basic geometries must be evaluated to determine the “optimum” crack arrest structure that will then be evaluated for life and inspection intervals. The wing will be designed for a 30,000-hour lifetime. The structural configurations defined in the table were analyzed for residual strength and crack arrest capability. The results were determined for rigid fasteners. Complete residual strength diagrams were developed for each structural geometry: (a) stiffener failure due to skin crack, (b) skin failure with crack, and (c) fastener shear failure based on allowable per 1,000 pounds. The next figure shows the critical stress or residual strength as a function of crack aspect ratios (a/w) for a skin crack across the stiffener. The residual strength of the skin, stiffener, and first fastener adjacent to the crack are shown. 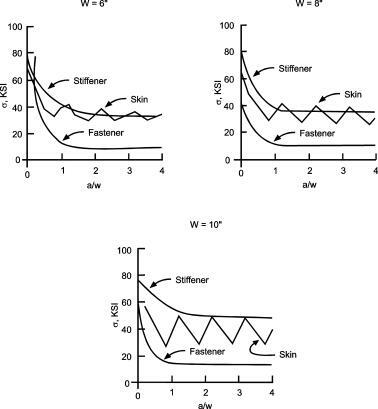 The skin critical stress is based on Kc and the stiffener critical stress is based on Ftu. The fastener parameter is scr/Qcr where scr is the critical stress per Qcr (Qcr = 1000 lb). The curves shown are for 60% stiffening and were generated using methods described in Section 4.5. Similar curves would be generated for 40% and 50% stiffening. The results demonstrate an increase of residual strength with increasing percent stiffening. Residual strength decreases with increased stiffener spacing. 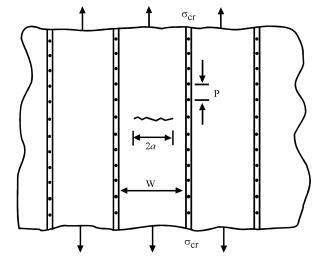 The following figure shows the residual strength diagram for the skin stiffener panel for a crack located across a broken stiffener. The variation of residual strength with crack size is shown for the skin and the adjacent stiffeners at 40, 50 and 60 percent stiffening. The critical stress for the skin is based on Kc and the adjacent stiffener critical stress is based on Ftu. This structural crack condition is the most critical of the three cases. Since the stiffener is failed, the load transfer carrying capability of the stiffener is lost and actually causes the crack to open more and increase the skin stress intensity level. This case should be considered primary in Fail Safe Crack Arrest structural design. The residual strength of the skin stiffened panels for a structural crack located at mid-bay are shown in the next figure. The structural geometries analyzed are the same as for a skin crack located across a stiffener. Again only the 60% stiffening curves are shown. The effect of increasing percent stiffening on increasing residual strength can be seen in the figures for each bay width. For a given percent stiffening, the residual strength of the structural panel decreases with increased bay width. (1) For a skin crack located symmetrically across a stiffener, the critical structural element is either the stiffener or skin. (2) For a skin crack located symmetrically across a failed stiffener, the critical structural element is the skin. (3) For a skin crack located symmetrically between stiffeners, the critical structural element is the skin. (1) A skin crack located symmetrically about a stiffener. (2) A crack in the stiffener with a crack in the skin. 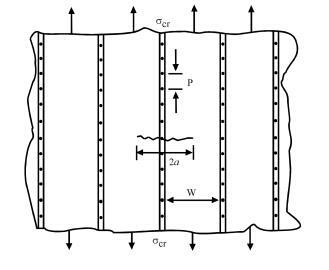 The selection of 60 percent stiffening was also enhanced by the crack arrest capability of the structure for a broken central stiffener situation. Since the results of the trade study considered rigid fastener connections, the effect of fastener flexibility or deformation has to be evaluated. Using techniques described in Section 11.2 and Section 4.5, a model was developed to obtain the stress-intensity factor for this configuration. The stiffeners were simulated by a lumped stiffness finite-element mesh system. This system was over-layed on the finite-element mesh system of the skin. The mesh systems were connected through discrete nodes that simulated the fastener flexibility by “soft-springs”. Crack progression was simulated by unzipping double nodes. The variation of stress-intensity factor with through-the-thickness crack size is shown in the next figure. Comparison with the behavior of an unstiffened panel shows the decrease in stress-intensity level due to the load transfer at a given crack size. The stiffener stress concentration factor due to load transfer (sg + Dsg)/sg and the first fastener loads are shown in the following figure. In an effort to demonstrate the interrelationships between all the elements in the damage tolerance analysis, the results of all the analyses have been collected on a single figure. The most critical case is the crack in the skin with the central stringer broken. This is the case presented. The figures shows the residual strength diagram, the crack growth curve, the degradation of residual strength as a function of time, and the assumed load spectrum. The residual strength diagram and the crack growth curve are drawn in an unusual way, with the crack axis to the left and the cycle axis to the bottom. This has been done to get all plot properly positioned. Initially, when the crack is small, the center stringer is still intact. Since the attachment holes in skin and stringer are assembly drilled, both holes are assumed initially flawed (0.05 flaw). This means that the center stringer will fail at a certain moment in time. The occurrence is shown in the crack growth curve, because it is important for the life. The residual strength diagram is only for the case with the center stringer failed, because that is the relevant situation. Corresponding points in the three diagrams are indicated by A, B, C; A’, B’, C’; A”, B”, C”; and . The assumed load spectrum is a gust exceedance spectrum for 30,000 flight hours, or 1 lifetime. Average flight time is supposed to be 3 hours, so the life is 10,000 flights. The vertical axis shows accelerations. It is assumed that the conversion to stresses is properly made, so that a point in the exceedance diagram corresponds with a point at the same level in the residual strength diagram. Limit load is assumed to be as the once-per-lifetime occurrence, which brings the design ultimate at the indicated level. The techniques described in Section 5.4.1.2 were used to develop the mission segment stress history from the load spectrum. This stress history was then used for the crack growth predictions. The spectrum permits determination of the fail safe loads. It is assumed that the spectrum may be linearly extrapolated. Only PLT, PDM, and PWV are indicated. The load PLT is the highest load occurring in 20 lives, i.e., it has a frequency of occurrence of 5 x 10-2 in one lifetime. The Depot Level fail safe load occurs once in 5 lives, so it has a frequency of occurrence of 2 x 10-1 in one lifetime. Finally, PWV occurs once in 1000 flights. The damage tolerance requirement for intact structure concerns the growth of the initial flaw to instability, i.e., to the point at which an instability would first be possible at the given fail safe load. For a non-inspectable, intact, fail-safe structure, the initial 0.02-inch flaw may not cause instability at PLT in one lifetime. Instability at PLT is first possible at . This point is at 34,000 hours which is just over one lifetime. Hence, the condition is satisfied. The instability would extend the crack from B to C. In the crack growth curve there would be a jump from B’ to C”, and crack growth would continue along C” D” parallel to C’ D’. Instability need not occur at , since PLT may not be encountered (PLT could occur once in 20 lives; it may not be met at all in less than 20 lives). In that case, crack growth will continue along B’ C’ D’. The possibility that the structure might qualify as Depot Level inspectable will now be considered. For Depot Level inspectability the crack growth period should be a quarter lifetime to instability at PDM. The instability would first be possible at . The in-service damage depends on inspection. For normal NDI without removal of fasteners, the damage would be 0.25 inch through-the-thickness crack (a = 0.25 in.). The 0.25 inch crack is at E’, the residual strength is at E. Thus, the period from to should be ¼ lifetime. Apparently, the structure could qualify for this. For a close-visual, Depot-Level inspection, the in-service damage is a 2-inch crack (a = 1 inch). This crack occurs at H’, with a residual strength at H. The period from to should cover ¼ lifetime, or 7,500 hours. Since it covers approximately 10,000 hours, the structure would still qualify as inspectable. Apparently, there would be no problems in satisfying any one of the primary requirements for intact structure. Next consider the requirements to be met at and after instability. The residual strength at instability should be 1.15 PLT or 1.15 PDM, whichever is applicable. The non-inspectable structure may show instability at . The crack will grow to and be arrested. At that moment, the residual strength is still at . Hence, the level of should be 1.15 times the level of . In reality, it is only 10 percent higher. Consequently, the structure does not qualify as non-inspectable after all. The Depot-Level-inspectable structure may show instability at . The crack will be arrested at , the residual strength still being at . The level of is 19 percent above , so that the structure would meet the requirement. Hence, the structure should be classified as Depot Level inspectable. Inspections should be called for either by NDI or close visual, since both are adequate as shown above. The requirements for remaining structure damage call for adequate crack growth life after instability. A two-bay crack is assumed to be Walk-Around Visual detectable. In that case, the required residual strength is PWV, the load occurring once in 1,000 flights. The remaining structure damage may not grow to critical at PWV within 5 times the inspection interval, i.e. 50 flights. At PWV, the skin crack would become critical at . However, the stringer becomes critical already at . At that point the skin crack extends to N’ (or ). Instability may occur at with arrest at . Hence crack growth from to should take at least 50 flights. According to the figure, this crack growth covers approximately 5,000 hours of 1,700 flights, which should be plentiful. However, at this point, the figure is deceiving, because the possibility of stringer failure by fatigue was ignored. When the crack extends to , its propagation is slow, because of load transfer to the stringer. Therefore, the skin crack can easily meet the requirement. But the load transfer induces a high stress in the stringer, and from now on the stringer has to be assumed cracked also. This means that the line for stringer failure is likely to be modified from to . This implies that a separate crack growth and residual strength analysis has to be carried out for the cracked stringer. For the purpose of illustration, suppose is the result of the analysis. Then the stringer will fail at . Hence, the crack growth life from to has to be 50 flights. This still can be met. Thus, the structure qualifies as a CAFS structure with Depot Level inspectability of the intact structure, and Walk-Around Visual inspectability of remaining structure damage. One thing still has been neglected. If the stringer starts cracking, it will become more compliant. This means that load transfer will be somewhat reduced. As a result, the stringer life will be slightly longer, whereas crack growth in the skin will be slightly faster. Since the life from to is 500 flights (1500 hours), this correction will not affect the conclusion that the structure meets the requirements. This particular example does not present the details of the analysis to the extent that others in this chapter and throughout the handbook do. The emphasis of this example is on interpreting the analysis. While the figure seems rather imposing at first glance, the interrelationships it displays are necessary to the full understanding of damage tolerance analysis.